Regain your eyesight naturally - is it possible? Most people believe that deteriorating eyesight is simply a consequence of getting older. There seems to be an expiry date on eyesight. Eye care professionals focus on measuring and correcting your refractive errors. As you probably discovered already, this is only a remedy when using glasses or contact lenses. Spectacles seem to correct your vision, but they do absolutely nothing for your eyesight. In fact, most people experience a gradual deterioration of their vision after they start wearing glasses. If you buy into the idea that vision is expected to deteriorate, then this scenario is as expected. Some population groups are more affected than others. For example, over 80% of the population in Hong Kong, Taiwan and Singapore is nearsighted. In western countries, the prevalence of nearsightedness is around 20% only. Why are so many Chinese nearsighted? The high degree of nearsightedness among Chinese people has a lot to do with the education system. Chinese children start learning to write from age four. There is an expectation that a 6-year-old should be able to writ perfectly shaped characters. Chinese children have an exercise book with a grid containing 100 boxes. They are expected to write uniform characters in the middle of these boxes. If not, they get bad marks. A very interesting study on Israeli school children counters the idea that vision problems are supposedly inherited. Israeli boys attending religious schools are supposed to study the Torah and therefore spend most of their time reading and reciting scriptures. 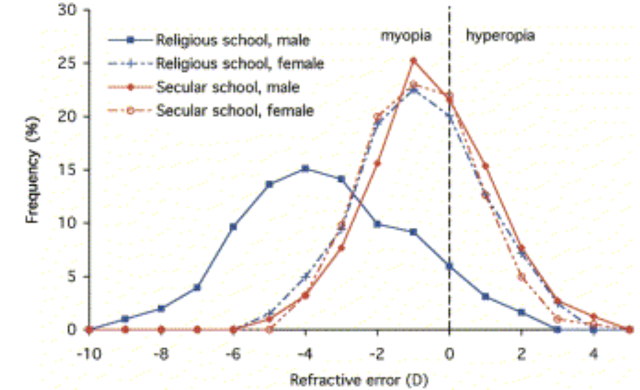 As a result, their eyesight is significantly worse than boys from non-religious schools. Furthermore, girls attending religious schools do not have to memorise the Torah, so their eyesight is not affected more than other children. In other words, genetics is unlikely to be involved because children from the same families will presumably have similar genetic make-up. In the mid-1960s, Frances Young, Washington University, already proved that genetics is unlikely to be a major factor in failing eyesight. His extensive study of an entire Eskimo community in Alaska found that 45% of the children had vision problems. However, he was only able to find two people among the parents and grandparents of these kids that had any vision problem. At least among Eskimos, vision problems do not appear to be inherited. Recent studies by biologists at New York University have shown that the development of eyesight is controlled by what you see rather than genetics. The eyes of a baby are about 17 mm in diameter. As the child grows, the eyes continue to grow over the first 15 years of life. The fully grown eye with perfect eyesight is 24 mm in diameter. Most children are born slightly farsighted with measurements between +2 and +3 diopters. The farsighted eye is slightly shorter and as a result, the image from the optic parts of the eye is focused slightly behind the retina. In simple terms, the eyes of children slowly grow, mostly towards the back, to a point where the image is focused perfectly on the retina. This process is known as emmetropization. An eye with perfect vision is known as emmetropic. Now comes the scary part. 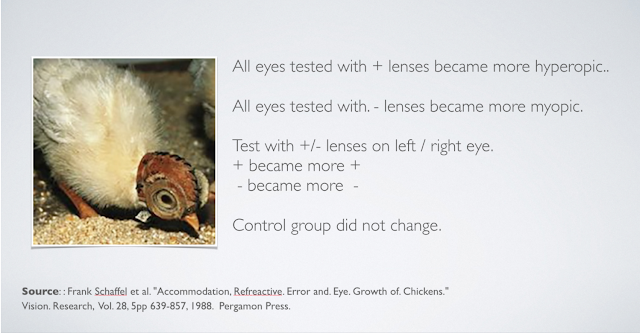 Experiments with a wide range of animals have shown that fitting lenses over the eye causes the eye to account for the lens in its growth (emmetropization). In other words, minus lenses cause the eyeball to grow longer. Plus lenses cause the eye to grow less, thus aggravating the visual error as longer eyeballs are more nearsighted. Experiments with higher primates (chimpanzees) show that the growth of the eyeball is influenced by lenses placed over the eye. For example, a lens covering only half the eye will cause only half the eye to grow in the direction dictated by the type of lens used. 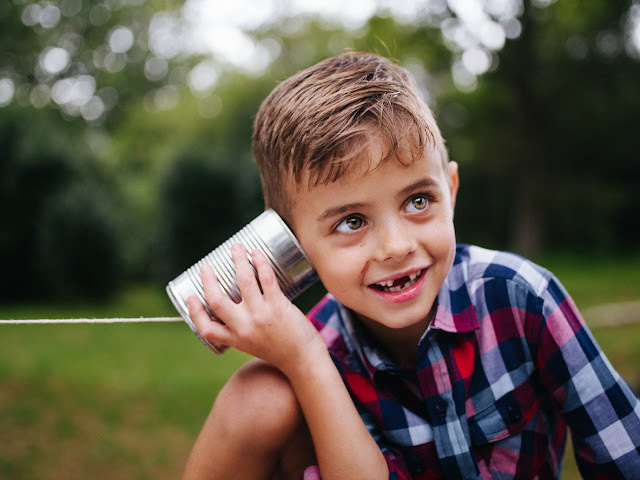 As a result, glasses are not the best solution to childhood vision problems. More than 60% of adults over 50 wear reading glasses or multifocal lenses. Reading glasses are prescribed when your visual system has only about a 5 diopter range. This usually occurs in your mid-forties. The plus lenses only bring your near point in by magnifying what you are reading. Putting on reading glasses does absolutely nothing for presbyopia. In many cases, it seems to make the condition worse. If you wear reading glasses, you have probably experienced that things you could read perfectly well without glasses becomes impossible to read without them after wearing them for a week or two. In a sense, the reading glasses become an addiction. Also, your reading glasses tend to become stronger over time. When you get to a point where your prescription is +2.5 or more, you discover that you can't see anything clearly without the glasses. Your distance vision is also gone. You can't drive without the glasses anymore. Wearing multifocal lenses are even more damaging to your natural vision. The longer you wear them, the more blurry the world becomes without them. Eye doctors are often very keen to recommend laser surgery for your nearsightedness. It all sounds so easy and simple. However, some people working at the FDA who were involved in approving this now regret their involvement. Also, many of the doctors involved in laser surgery still wear glasses. Have you ever wondered why? See “Lasik vs. Vision training” for more information about this. The latest in surgery options is to have lenses implanted into your eyes. The lenses are either implanted over your natural lens behind the iris or they are inserted in front of the iris. Again, this works, but what about if you wanted to have the implants removed? It turns out that this is not a simple procedure. Neither Lasik treatment nor lens implants actually do anything for your vision. You are still nearsighted despite the expensive procedures. See “More about lens implants” for the bigger picture. The good news is that something can be done about this. Over the last 20 years I have advocated a natural approach to eye care. Having worn glasses for more than 26 years (-5.50), I speak from personal experience. I must confess that I also did not believe that anything could be done about failing eyesight until I read a book about hypnosis. The book describes how a person was regressed back into her childhood. The hypnotist then brought the clear childhood eyesight up to the present. thought this was great and wanted to do this. That account gave me the inspiration to search for ways to get rid of my glasses. 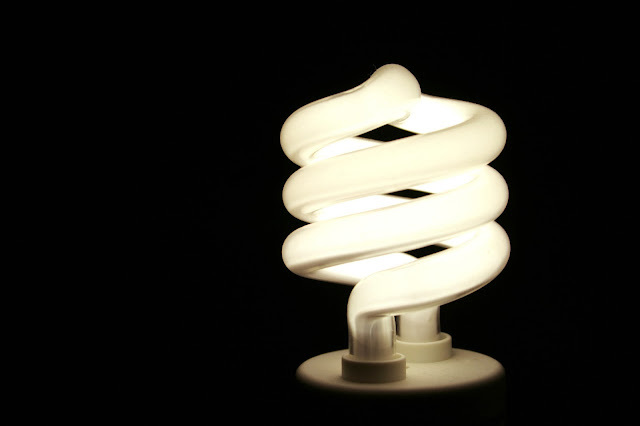 I discovered that energy is an important aspect of many people’s vision problems. My eyesight was cured by applying more energy to my visual system, not by the Bates Method. It took me three months to get my natural clear vision back. That is literally going from the top of the eye chart to the bottom line. Then I simply forgot about this for 5 years - no exercises, just normal vision. In 1996, I attended a summer course at the University of California. During the month-long seminar, I happened to casually mention that I used to wear glasses. My friends kept bugging me to share with them what I did to get rid of my glasses so one evening, I gave a talk to share what I did. To my astonishment, 60 people showed up. I had no idea that so many people were interested in this subject. Then, I became aware that more than 60% of the population in the western world wears glasses. I decided that I should do something to help people interested in getting rid of their glasses. The result is a workshop and a bestselling book, Improve Your Eyesight Naturally. So how can you get rid of your glasses? The simplest thing is probably to book a seat at one of my workshops around the world. In the workshop, you will discover exactly what your vision problem is, and more importantly, what you can do about it. You can also start by buying one of my books. If you have just mild nearsightedness (less than 2 diopters), you will have perfect eyesight after doing eye exercises for a week or two. With higher degrees of nearsightedness, you need to do more work and gradually change your contact lenses or glasses as your eyesight improves. For those of you who wear reading glasses, the process is relatively simple unless your prescription is more than +2.5 or if you wear multifocal glasses. More work is involved and you may need to go through a series of the cheap drug store reading glasses as your vision improves. T.G. wore strong plus lenses and could not see anything clearly without his glasses. Over the weekend, he was able to significantly reverse his presbyopia and therefore reduce the power of his glasses..
For those of you who have a high degree of myopia, this story will cheer you up. A lady in Singapore had -13.00 diopters in one eye and -8.00 diopters in the other eye. After one and a half years of vision training exercises, both her eyes were now -8.00 diopters and she could start to wear plastic lenses, which are cheaper and much lighter. After another year and a half, she now tells me that she is - 4.00 diopters and is starting to read without glasses. This is amazing!